Perhaps because it’s Sunday, I awoke feeling flimsy and shallow about writing this post. So, I’m writing in a moment to ponder real world problems and appreciate things for which I’m thankful. Ok, now on to the more frivolous. Dear Reader, allow me to tell you how I find myself in a most bewildering predicament. I finally fell in love with a limited edition candle. 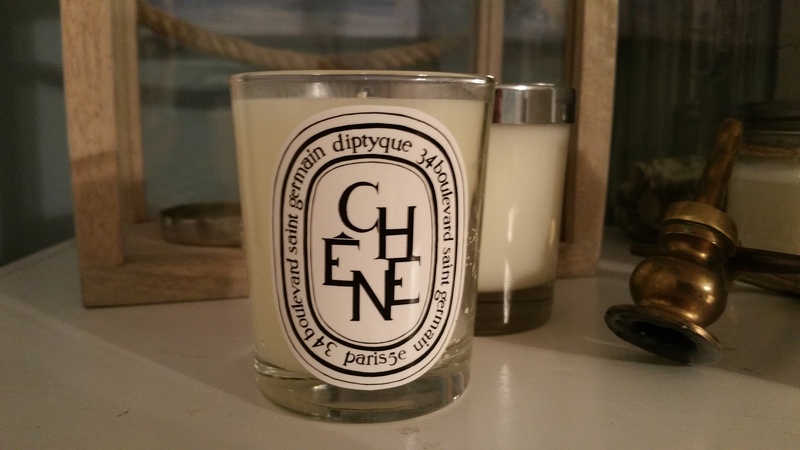 It’s name is Diptyque Chêne (Oak Tree) and must not be confused with the similar French word, “chien” (dog). Yes, I do love to amuse myself. I will describe a scene forever engraved into my plate of memories: I held in my hands a small but weighty white box wrapped in plastic, containing 6.5 oz of wax inside of an elegant glass jar. I thought to myself: “Now is the great moment. This is the part that keeps me coming back. This is what makes me a ‘haulic. '” Feeling the candle’s delicious weight, I slowly and reverently unwrapped the cellophane. Putting it aside, I gently pulled up the top of the white paper box, while simultaneously losing my grip on the outside world. By the time I held the candle in my hands, my eyes were blurred with joyous tears and I was weak at the knees. I closed my eyes, inhaling deeply and smiling. That smell. It was so familiar and yet so unusual. There wasn’t a hint of perfume, spice or the Artificial. No. Not that. Instead I was engulfed by the scent of raw, cut wood. I sped off to my chambers and frantically struck a match, urgently needing to unleash the pure scent within the wax. I reclined on my bed and let time pass. While it burned, the candle revealed to me its secrets. I came to realize that the familiarity I sensed was due to this candle’s scented likeness to Feu de Bois. The throw was so beautifully similar, that I began to wonder whether I’d lost my sense and accidentally lit Feu de Bois. So I bolted to my feet and called for a blind scent test. I dragged Mr. G-, my bewildered husband, to my side and demanded that he hold one candle under my nose and then a second one, while my eyes were closed. Under these conditions, I (and he) detected the difference right away and accurately identified both Feu de Bois and Chêne. But, by then I was wondering: what was it that made them distinct? After some intense soul searching I realized with a jolt that Chêne is not at all smokey! 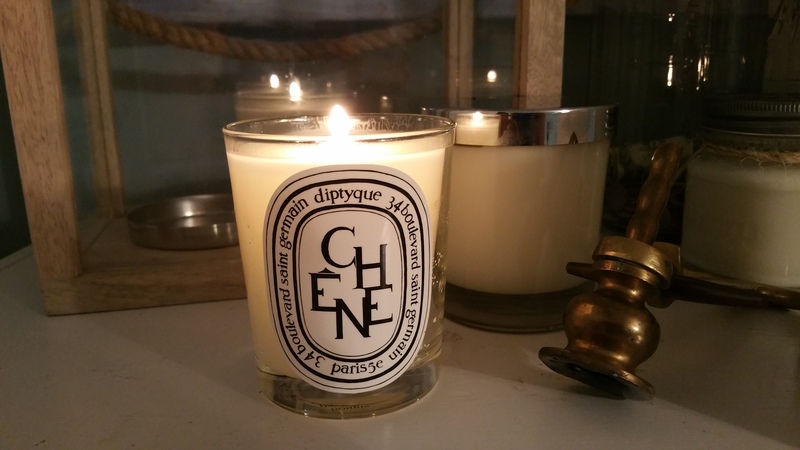 The common denominator between Chêne and Feu de Bois is actually the precise smell of wood. But once having gained some clarity, I again let my thoughts drift and I began to wonder why Diptyque categorizes so many candles as “woody” when to me only these two belong. Candles within Diptyque’s woody category include Opopanax, Noisetier, Cyprès, Ambre, John Galliano, Cuir, Vétyver, and Bois Ciré, all of which I’ve possessed and burned. Initially my protestations arose against Opopanax and Vetyver being placed in the same category as Chêne! Those are both exotic and powdery and smell more like cologne than wood. On the other hand, John Galliano smells to me more like Pomander (cloves and spices) than anything, and should be in the spicy category. While we’re at it, let’s put Oranger in the spicy category too, because it smells less like citrus than like spice. Noisetier and Cyprès are marvelous, but Noisetier is nutty and Cyprès is fresh and green. The remaining scents also belong elsewhere. I haven’t smelled Santal, Myrrhe, Musc, Maquis, or Benjoin, also from the woody category, or I’d categorize them as well. But for the sake of argument I’d probably un-label them as woody. When all is said and done, Chêne and Feu de Bois have earned their woody status and belong only in the company of each other. And, when all is really said and done, it’s obvious that I do not understand what makes a scent woody. 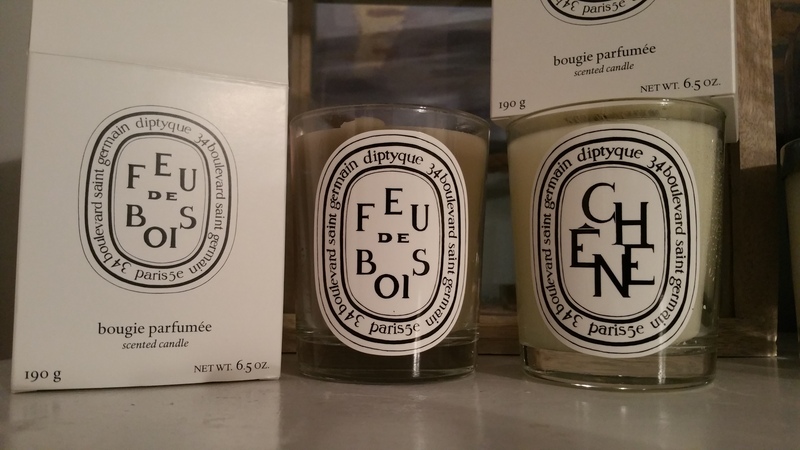 That’s because I’m not silly enough to say that Diptyque is wrong. And now I ask of you: tell me what makes a scent woody! I simply must have some resolution. I cannot stand to be ignorant. Please hear my plea! I am indisposed and plagued with inner turmoil. I will be awaiting your comments with bated breath.